Thanks to my article on extracting information from C2 systems that was published in Australian Defence Magazine earlier in the year, I had the opportunity to present a paper at MilCIS 2017. 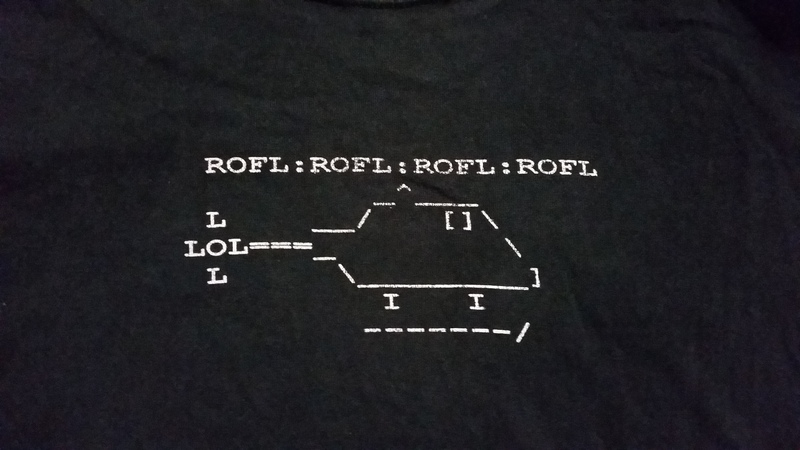 MilCIS is the Military Computer Information Systems conference that has been running for multiple years in Canberra. If you’re listening to aviation podcasts then you *have* to listen to Jack, Jeb & Dave from the Uncontrolled Airspace show (aka UCAP). With well over 400 episodes produced over more than eleven years, these guys are the power-house of the General Aviation podcast world and have deservedly won awards for their efforts. UCAP was one of the first podcasts I was listening to way back in 2007 along with Come Fly With Me, Airspeed, The Airplane Geeks and the PilotCast. While some of these have stopped producing, UCAP is still going strong and is still and fun & interesting, a testament to the aviation knowledge of the hosts and the dynamic that exists between them. The Civil Aviation Safety Authority here in Australia (our version of the US’ FAA) prints a number of “Close Calls” stories in their various publications. The objective is to present stories where a pilot came close to an accident so that other pilots can learn from the mistakes that were made. Having read a number of these stories I can attest to their benefit as I’ve taken on some of the lessons and have recognised scenarios that, had I continued my flight, may well have put me in a similar (or worse) situation. Given this, it was relatively easy to agree to provide an article for CASA’s 2017 Sport Aviation Close Calls booklet. 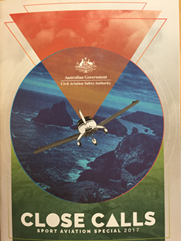 The Sport Aviation people wanted to get close call stories from various executives & staff members within the Sport Aviation Organisations, such as RA-Aus, the Glider Federation of Australia, the ABF, etc. 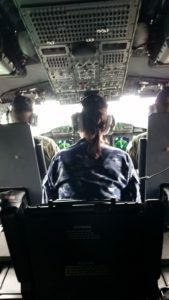 With my role as Operations Manager for the ABF and an existing article that I’d recently had published in the ABF’s Aeronotes magazine, my story was just what they were after. I’ve included the text below in case you want to read it. It’s not a long story but it does help point out the concerns associated with low flight, even in a relatively slow moving balloon! We’ve all been told again & again about being vigilant for powerlines & looking out for the poles rather than the wires. Some of us even make it a rule to not fly below powerline height except on our final approach to land. While I’ve previously had a couple of “powerline moments” in the past, both of them were easily avoided and could be anticipated based on surroundings (eg: a pumping station near a lake had a SWER heading across a field, a set of powerlines were running along a road but the poles were hidden by trees, etc). We’re taught to look for these clues and generally do a good job of avoiding wire strikes. 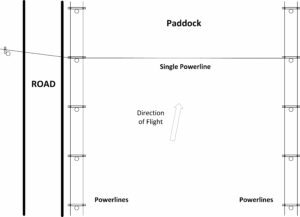 My latest encounter with a powerline was a big surprise and could have been a major concern if the paddock I’d been flying over was one where I was landing. Looking at the power poles running either side of the paddock, it appeared that the lines were running parallel to my direction of travel. There did not appear to be any indication (nor expectation) that the two parallel sets would be connected in any way. While flying up the paddock I noticed horses ahead in another paddock near a house so, using the quiet burner, commenced a gentle ascent. At about 60-70’ above the ground my passenger said “Power line!” so I immediately triggered the blast valve & increased our rate of ascent. I was then able to see the power line against the background and realised it was still a fair distance away. We would have cleared it had I continued the gentle ascent on the quiet burner but, had I not initiated the climb we may never have seen the line and would have experienced a very surprising wire strike event. 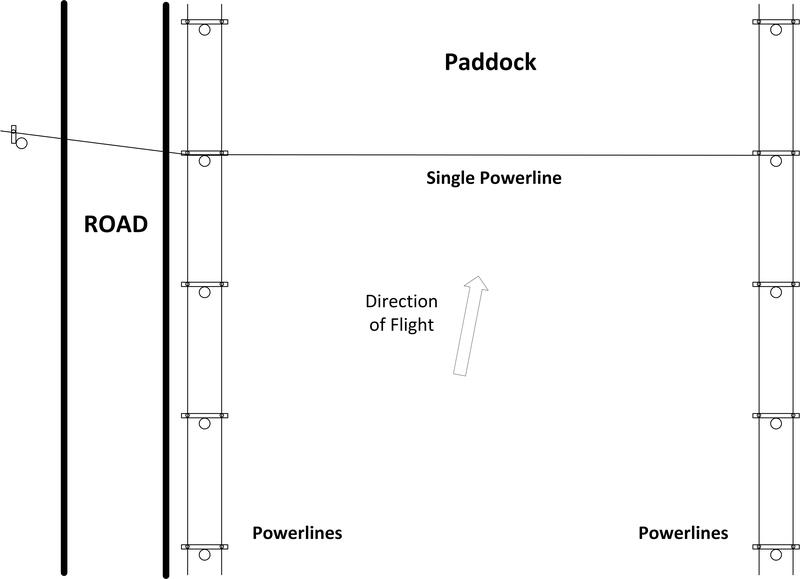 So, why was there a powerline running across the paddock? As per the diagram, there was a spur running off to a building some distance away. Rather than just run the spur from the powerlines running along the road, a line was transferred from the lines on the other side of the paddock over to the lines along the road and then off to the building. What the reasoning was behind this transfer line is not known to me at this time. For myself it was very unexpected, quite eye opening and I’ll certainly think twice before dropping down below power-line height even if I think I’ve identified all the powerline tracks in the vicinity. 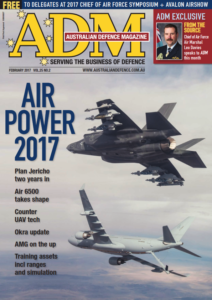 Thanks to having my Data Access and Analytics article published in Australian Defence Magazine, I was given the opportunity to provide a short presentation on the topic at the RAAF’s Aeronautical Environment Working Group (AEWG) seminar during Avalon 2017. 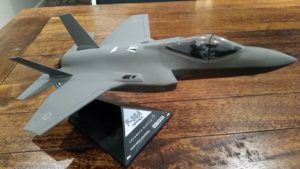 The AEWG is a part of the RAAF’s “Plan Jericho” initiative that is converting the RAAF to a “Fifth Generation Air Force” to take full advantage of the new capacities being introduced by platforms such as the F-35, F-18F Super Hornet and EA-18G Growler. 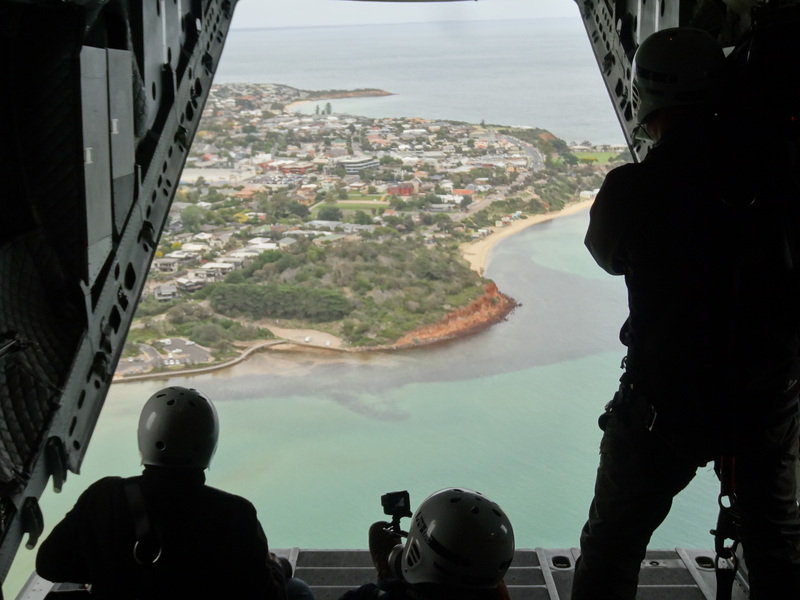 The one day seminar was held on the Thursday in a large conference room during the Avalon Air Show and included a number of top-brass from RAAF, including the Deputy Chief of Air Force and a number of Air Commodores. Based on the article, I prepared a short slide-pack of info-graphics that highlighted the key elements and presented it to those assembled. I’m told the presentation went well and, hopefully, it influenced some of those present to consider their information systems when bringing a new platform on line or approving the installation of a new Command & Control system. Captain Jeff Nielsen has been producing the Airline Pilot Guy podcast for over six years, not including his early episodes that were produced as the Catholic Pilot show. In addition to releasing his show as an audio podcast, Jeff also releases his episodes as videos on YouTube, allowing his audience to watch the stream live as it’s recorded and interact via a chat room session (I think he was the first aviation show to do live feed recording with a chat session). While the show was initially produced as a solo effort by Jeff, over recent years he’s been joined by friends who are known as The APG Crew and contribute to the fun and help provide additional points of view. The crew typically includes Doctor Steph, Miami Rick, Captain Nick (aka Old.Pilot) and First Officer Dana, most of whom are able to join in the fun on a regular basis. Other guest hosts are also included here and there including hosts from other shows, Maine Man Micha, Captain Al and many more. Jeff produces an episode per week with each one typically lasting from one & a half to three hours which is an absolutely amazing feat. The episodes start with updates on what the hosts have been up to in the past week, discussions on recent news stories and feedback from the audience (“The most important part of the show” says Jeff :) ). The feedback can easily be the largest part of the show and even with hours per week the crew don’t get through all of it. 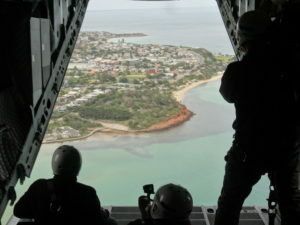 The feedback can range from aviation related questions for the crew to answer through to trip reports and commentaries. Space Rocket History: Well Worth the Listen! 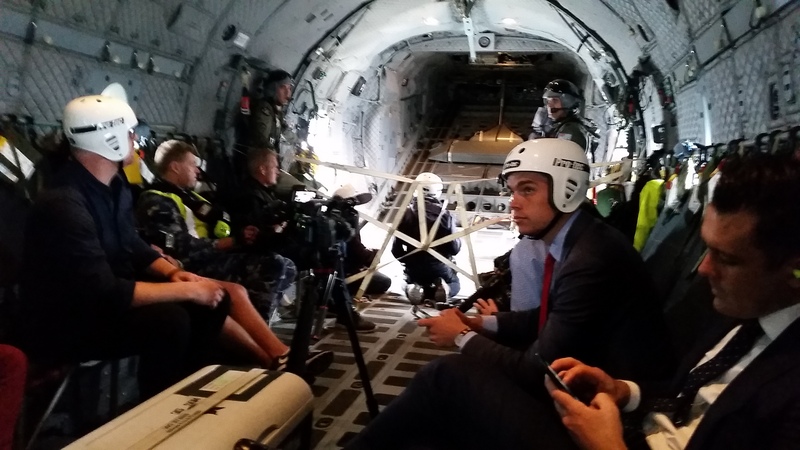 Our ride for the day: the RAAF’s new C-27J Spartan. Designed to deliver cargo and troops into front line environments, the C-27J is derived from the Alenia Aeronautica G.222 transport manufactured by Leonardo, the conglomerate that absorbed Alenia Aermacchi along with a number of other companies including AugustaWestland. 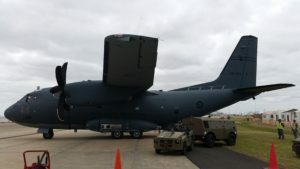 The aircraft provides the RAAF with a battlefield lift capability they’ve not had since the withdrawal of the DHC-4 Caribou some years ago and allows them to deliver loads to 1,900 airfields in the region compared to about 500 for the C-130J Hercules. 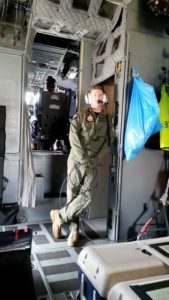 Occasionally referred to as the “Baby Hercules” due to having the same avionics and engines as a C-130J Hercules, the aircraft also has the same floor strength as a C-130 and is able to accommodate the same pallets if they’re turned sideways. This feature allows loads to be moved from a Hercules directly to a Spartan without requiring re-packing, which is a major time saver when breaking out loads for onward delivery. Peter Meehan (the voice of Avalon) opens the media launch event. The flight was being arranged as part of the media launch for the Australian & International Aerospace & Defence Exposition (aka Avalon 2017). This event involved some speeches and a number of military & civilian airshow aircraft putting on displays to give the media a taste of what they could expect when the show commenced in the next week. I had received notification of the event from the RAAF’s media group and submitted my Expression of Interest for the media flight. About a week before the event I received a confirmation email from them with details of what to wear and where to meet on the day. Despite being rather busy at work, I was able to wrangle a day off and drove to Avalon Airport in the morning, entering the airshow precinct via the main event entrance on a side-road away from the usual airport entrance. Very soon after arriving I was reminded that these events are not just about the aircraft as it was also an opportunity for me to catch up with some of the aviation media people I’ve worked and socialised with previously. After the speeches we all moved outside the chalet to enjoy the show with many of us moving to the fence line to get as close as possible to the aircraft as they took off and landed on the runway. During the air display the call went out for those people selected for the media flight. Leaving the others to enjoy the displays and take more photos & videos of the action, we went back inside the chalet for a briefing by the 35 SQN personnel on topics such as personal breathing equipment, what could be brought on and how the flight would proceed. We also had to fill in a standard RAAF passenger declaration form confirming that we were not bringing any dangerous goods aboard (eg: loose unprotected batteries, flammable substances, etc). We entered the aircraft via the ramp at the back which was lowered but not touching the ground, leaving us with a bit of a step up. One of the load masters was on the end of the ramp with hand extended, ready to help each of us on. 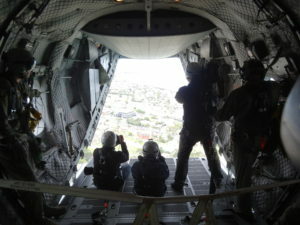 Once inside we were directed to sit in the fold-down webbing seats lining both walls of the cargo compartment. As you would expect of a combat aircraft, the interior is purely functional and designed to be able to accommodate pallets, vehicles and/or people with minimal re-configuration between loads. The walls are padded with standard military style diamond pattern insulation material that cuts down on some of the noise, but ear plugs were definitely necessary to reduce hearing damage once the engines fired up. The floor and walls were adorned with tie-down points to facilitate safely locking down loads and each of the seats had at least one personal breathing kit in case of emergency. This kit is intended to be used should the cabin fill with smoke or other gasses on board and consisted of a head covering and neck seal, clear plastic face panel and oxygen supply bottle. 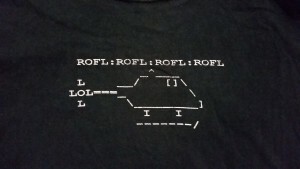 We had been briefed on its use prior to boarding. With the engines fired up we taxied out and were soon in the air. The acceleration on take-off with a comparatively light load on board was certainly spirited to say the least. After a very short take-off we headed towards the South East and wound up passing over Phillip Island, going right over the race track which I was able to see out the small window (not really designed for seated viewing – it’s a military transport, not an airliner :) ). When this media flight had first been announced the indications were that our flight would have been in formation with the RAAF Roulettes formation aerobatic team but, sadly, this was not to be. I’m guessing the certifications and clearances required to allow the Roulettes to fly a tight formation on a C-27J had not yet been completed, thus preventing them from joining us, which is a shame as it would have made for some fantastic photos and videos. The view out the back was impressive but would have been better if there’d been another aircraft with us. 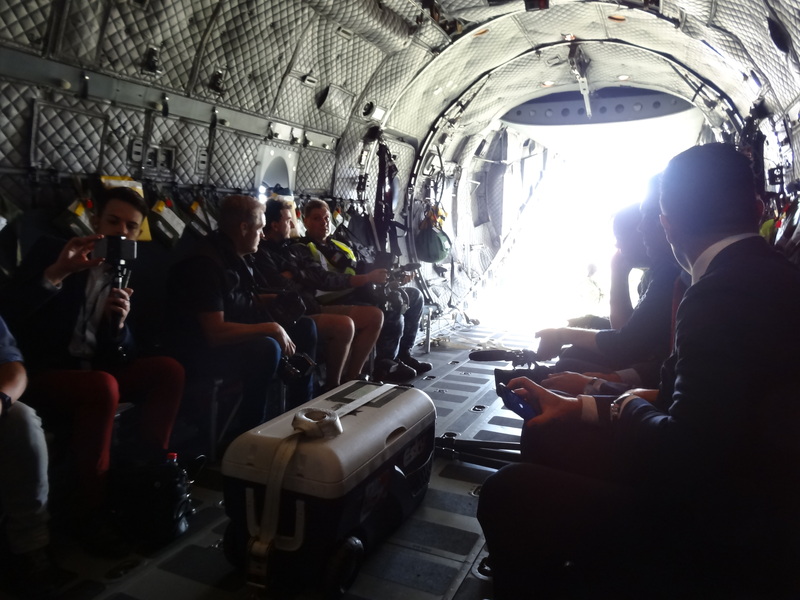 Following our buzzing of the airport we went and had some more low level fun as the last of the media recordings were wound up, then everyone buckled up for the landing. With the low-level bouncing around and no view, many people were starting to look a bit green while some took out their barf bags just in case. I’d already double-bagged mine at the start of the flight and had it ready to grab in my pocket but never wound up needing it. We had been warned to expect some intense deceleration as we’d be doing a tactical landing and they certainly didn’t skimp on the stopping power. We’d barely touched down when the propellers were cycled to full reverse pitch, the revs came up and the brakes went on. Even with a good grip on the seat frame with one hand and the wall behind me it was rather intense and we stopped in a VERY short distance! Two pilots with one of the Squadron staff members in the jump seat. Once off the runway the ramp was opened once again and the aircraft again used its reverse pitch to back into its parking space with the loadies on the ramp giving directions to the pilots. Nice trick! 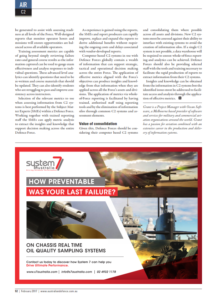 In February this year I had an article published about data access and analytics in Australian Defence Magazine. 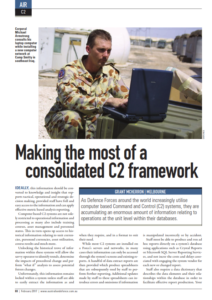 Focusing on Command & Control (C2) systems and the issues that must be addressed in order to access and analyse the copious amounts of information contained within them, the article also discussed the importance of having a “Whole of force” view of the C2 system data. The full text of the article appears below. You can also access the article as a PDF by clicking on the link below. As Defence Forces around the world increasingly utilise computer based Command and Control (C2) systems, they are accumulating an enormous amount of information relating to operations at the unit level within their databases. Ideally, this information should be converted to knowledge and insight that supports tactical, operational and strategic decision making, provided staff have full and easy access to the information and can apply effective metric based analysis reporting. Computer based C2 systems are not solely restricted to operational information and processing as many also include training courses, asset management and personnel status. This in turn opens up access to historical information relating to unit currencies, personnel currencies, asset utilisation, course results and much more. Unlocking the historical trove of information within these systems will allow the savvy operator to identify trends, determine the impacts of procedural change and perform “what if” analysis to assess potential future changes. Unfortunately, this information remains locked within a system unless staff are able to easily extract the information as and when they require, and in a format to suit their need. While most C2 systems are installed on a Force’s servers and networks, in many cases their information can only be accessed through the system’s screens and existing reports. A handful of data extract reports are then provided which produce spreadsheets that are subsequently used by staff to perform further reporting. Additional updates made by staff to these spreadsheets can introduce errors and omissions if information is manipulated incorrectly or by accident. Staff must be able to produce and run ad hoc reports directly on a system’s database using applications such as Crystal Reports or Microsoft SQL Server Reporting Services, and not incur the costs and delays associated with engaging the system vendor for each new or changed report. Staff also require a data dictionary that describes the data elements and their relationships within the database in order to facilitate effective report production. Your C2 system vendor should be able to provide training and guidance for staff in the use of these tools and the best way to navigate the data elements and relationships within their system. Once established, these tools will allow trained & authorised staff to produce and quickly tailor reports that best suit the changing needs of the Force. With access to information and reporting tools in place, it is important to be able to perform comparisons across units and asset types using common assessment elements such as availability, utilisation and readiness. To facilitate this, senior managers must avoid creating silos of information around assets or divisions. If a C2 system is only managing a specific asset or division, significant effort will be required to include its information in whole-of-Force reporting. An additional barrier to information analysis across an entire Force is a lack of common structures and classifications for assessment elements such as qualifications, mission outcomes and training results. The specification of common assessment elements must be driven from the headquarters level and used by all units to provide a solid foundation for common reporting across the entire Force. Having a shared C2 system for all assets and divisions with centralised management will facilitate this. Removal of information silos and the establishment of a common classification system will enable comparative benchmarking across the entire Force, facilitating the identification of issues that may have common organisational root causes or be specific to a given asset or division. Without this environment, significant effort will be required to produce reports and perform detailed analysis of the information contained within C2 systems. 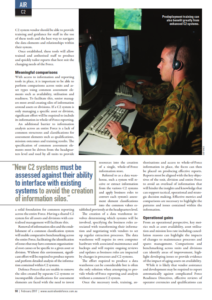 Defence Forces that are unable to remove the silos created by separate C2 systems or incompatible classifications for assessment elements are faced with the need to invest resources into the creation of a single, whole-of-Force information store. Referred to as a data warehouse, such a system will receive or extract information from the various C2 systems and apply business rules to convert each system’s assessment element classifications into the common values established previously at the headquarters level. The creation of a data warehouse involves determining which systems will be involved, specifying the business rules associated with transforming their information and negotiating with vendors to set up regular extraction processes. The data warehouse will require its own computer hardware with associated maintenance and backups and will require ongoing reviews and updates as business rules are impacted by changes in processes and C2 systems. The effort required to produce a data warehouse can be considerable but is often the only solution when attempting to provide whole-of-Force reporting and analysis without a common C2 system. Once the necessary tools, training, authorisations and access to whole-of-Force information in place, the focus can then be placed on producing effective reports. Reports must be aligned with the key objectives of the unit, division and entire Force to avoid an overload of information that will hinder the insights and knowledge that can support tactical, operational and strategic decision making. Effective metrics and comparisons are necessary to highlight the patterns and issues contained within the information. From an operational perspective, key metrics such as asset availability, asset utilisation and mission loss rate including cancellation reasons can highlight the impacts of changes to maintenance processes and spares management. Comparisons and benchmarking across units and divisions can identify areas of improvement, highlight developing issues or provide evidence of the impact of aging assets on availability. While it is likely that vendor assistance and development may be required to report automatically against complicated Force Readiness Directives, effective reviews of operator currencies and qualifications can be generated to assist with assessing readiness at all levels of the Force. Well-designed reports that monitor operator hours and missions will ensure opportunities are balanced across all available operators. Training assessment metrics are capable of going beyond simply reviewing failure rates and general course results as the information captured can be used to gauge exam effectiveness and analyse responses to individual questions. These advanced level analytics can identify questions that need to be re-written and course materials that should be updated. They can also identify students who are struggling to pass and improve consistency across instructors. Selection of the relevant metrics to use when assessing information from C2 systems is best performed by the Subject Matter Experts (SMEs) within a Defence Force. Working together with trained reporting staff the SMEs can apply metric analysis to extract the insights and knowledge that support decision making across the entire Defence Force. As experience is gained using the reports, the SMEs and report producers can rapidly improve, replace and expand the reports to derive additional benefits without requiring the ongoing costs and delays associated with vendor-developed reports. Computer based C2 systems in use with Defence Forces globally contain a wealth of information that can support strategic, tactical and operational decision making across the entire Force. The application of effective metrics aligned with the Force’s objectives can produce insights and knowledge from that information when they are applied across all the Force’s assets and divisions. The application of metrics via whole-of-Force reporting is facilitated by having trained, authorised staff using reporting tools and by the elimination of information silos through common C2 systems and assessment elements. Given this, Defence Forces should be considering their computer based C2 systems and consolidating them where possible across all assets and divisions. New C2 systems must be assessed against their ability to interface with existing systems to avoid the creation of information silos. If a single C2 system is not possible, a data warehouse will be required to ensure whole-of-force reporting and analytics can be achieved. Defence Forces should also be providing selected staff with the tools and training necessary to facilitate the rapid production of reports to extract information from their C2 systems. Insights and knowledge can be obtained from the information in C2 systems but the identified issues must be addressed to facilitate access and analysis through the application of effective metrics. Grant is a Project Manager with Ocean Software, a Melbourne based provider of software and services for military and commercial aviation organisations around the world. Grant has a passion for aviation combined with an extensive career in the production and delivery of information systems. Last week I took part in a media teleconference with Lockheed Martin’s media representatives and a number of local journalists. 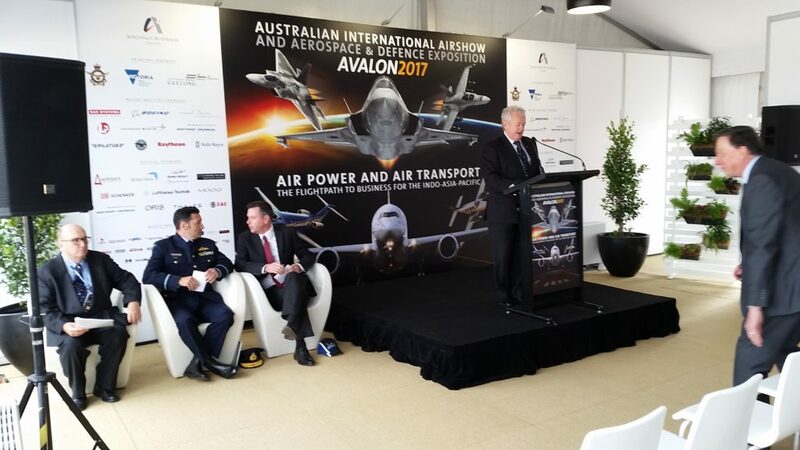 The purpose of the call was to discuss Lockheed Martin’s presence next week at the Australian International Airshow and Aerospace & Defence Exposition (aka Avalon 2017). The big news is, of course, that Australia’s first two F-35A Joint Strike Fighter aircraft will be taking a break from their training duties at Luke AFB in the USA and are scheduled to arrive at Avalon on Friday the 3rd of March. Unlike previous events where we had the full scale mock-up on display, the RAAF are going to have two of the real things there. There’s no indication whether they’ll be doing any flying during the show but they will be on static display at least. We’re waiting to hear from the RAAF Media team as they’re the ones coordinating the aircraft, not Lockheed Martin. 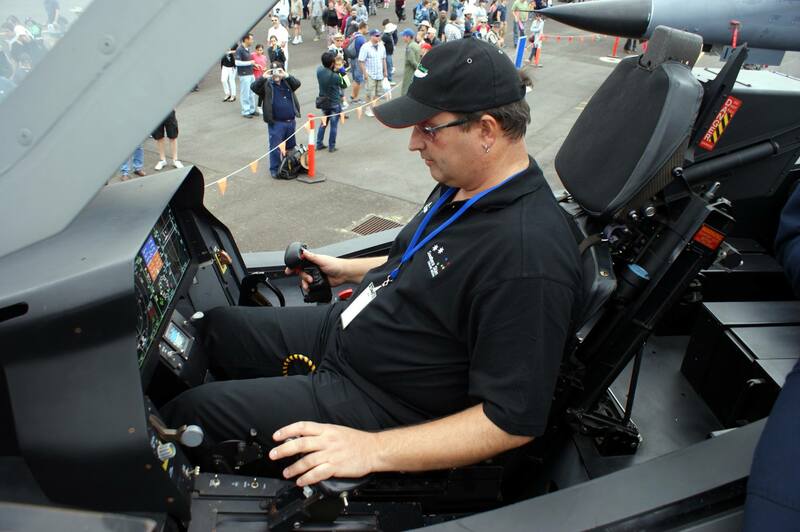 Checking out the F-35 full scale mock up at the Pt Cook air show in 2014. Lockheed Martin’s big drive will be their F-35 Expo tent which will be featuring 14 Australian companies that are supplying to the global F-35 program. Among many other items, the tent will feature a mock-up Pratt & Whitney F135 engine on a Maranz engine trailer which will be quite a feat to get into the display given how large and heavy it is. Tuesday’s media briefings will commence in the morning with LtGen Davis from the USMC who will brief on the F-35B’s operations in the Asian region with particular attention to their deployment to Japan. The F-35B model features the forward lift fan and rotating rear exhaust nozzle which work together to provide Short Take Off and Vertical Landing (STOVL) capability. Later on Tuesday there will be a combined briefing from the Joint Strike Fighter (JSF) division within Australia’s Capability Acquisition and Sustainment Group (CASG) and the JSF’s Joint Program Office (JPO) featuring LtGen Bogdan (head of the JPO) and Lockheed Martin’s Tod Mellon. This will focus on industry involvement and how the F-35 is impacting Australian industry. Finally, on Friday morning there will be a briefing from Jeff Babione (Lockheed Martin’s General Manager of the F-35 program) with a production update on the program going forward. They expect to have a pair of MH-60R “Romeo” helicopters there from Navy and will be celebrating the fact that all of the aircraft have been delivered within five years of the contract being signed, including having some aircraft already undertaking operations at sea. 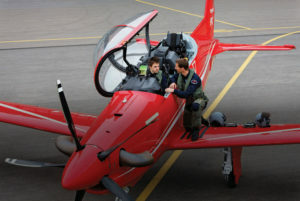 Stock image of a PC-21 aircraft supplied by Lockheed Martin and Pilatus. There’s also a good chance that Australia’s first two Pilatus PC-21 aircraft will be on display at the show which would be a big plus for Lockheed Martin’s training division who are providing the PC-21 and their integrated pilot training system under AIR5428. 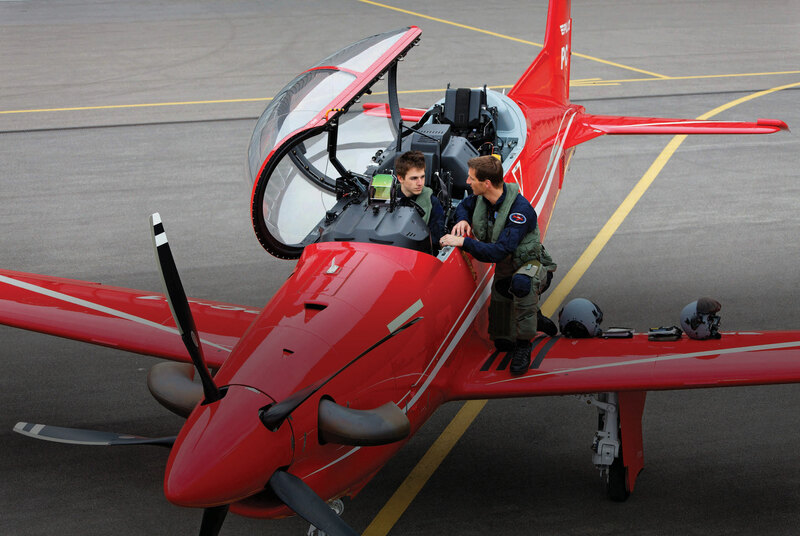 This program will see pilot training migrated to the PC-21 at East Sale and Pearce under a consortium from Lockheed Martin, Pilatus and Hawker Pacific. 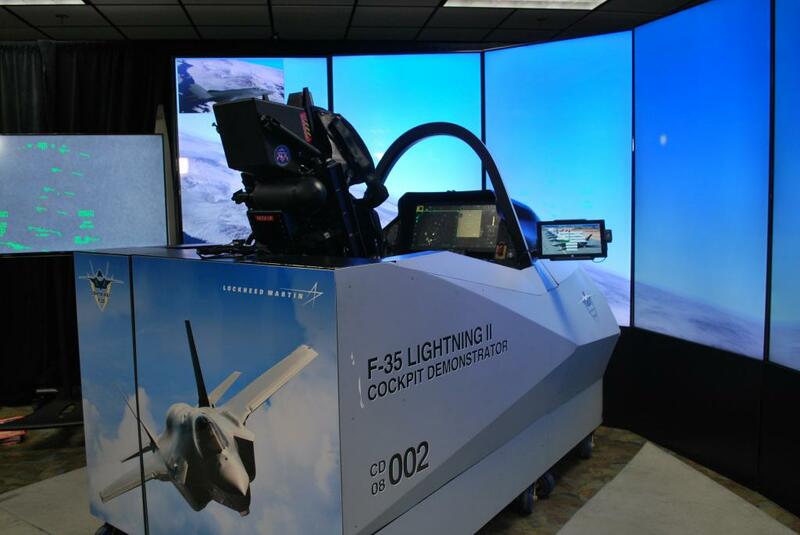 On Saturday the F-35 expo tent will be converted into a virtual-reality experience for younger students to experience F-35, Orion spacecraft and future space directions. This module was first rolled out at Farnborough Air Show in the UK and is intended to inspire students to become our future aerospace engineers, pilots & astronauts. It’s going to be a busy show for Lockheed Martin and I’m looking forward to catching up with as many of their groups while I’m there. Every two years the Australian International Air Show is hosted at Avalon Airport to the west of Melbourne. 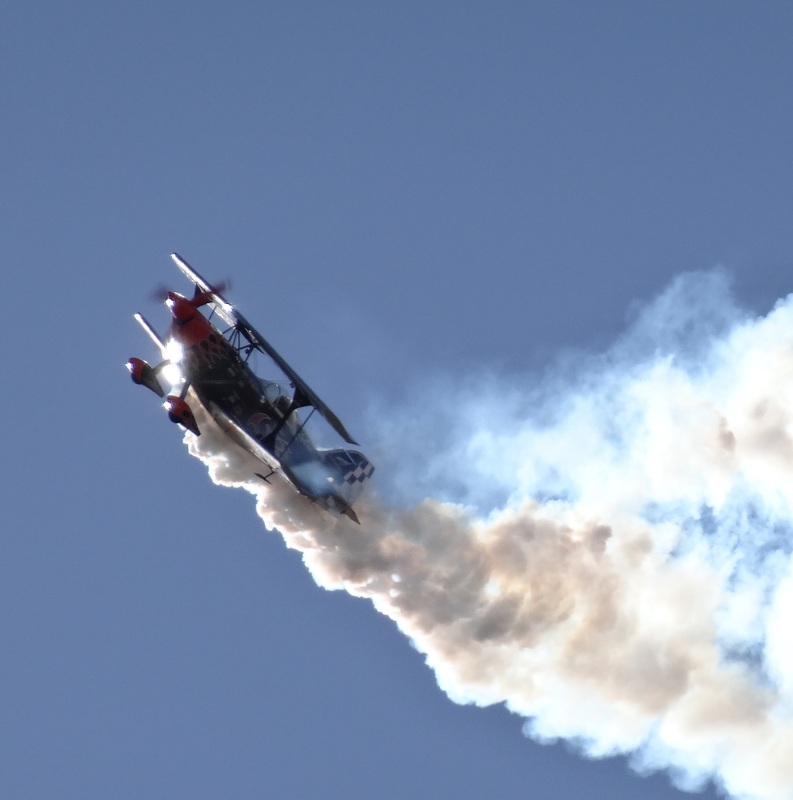 Generally referred to simply as “Avalon” or “Avalon Air Show,” the event comprises a trade show (the Australian International Aerospace & Defence Exposition) and an air show that’s open to the public on Friday afternoon through to Sunday. As usual, I will be attending Avalon for the trade show industry days with a media pass to gather content for Plane Crazy Down Under but, for the first time ever, I’ll also be attending as an aerospace corporate (aka “trade”) visitor. Thanks to my job with Ocean Software, I have a number of clients & prospects to meet with and some events to attend during the trade days. It’s going to be interesting for me to attend the event with a more critical & technical interest in some of the exhibits than I’ve had previously. Australia’s first two Lockheed Martin F-35As. The C-27J Spartan will finally be here in RAAF colours. Hopefully the RAAF will have one of their new Boeing P-8A Poseidon aircraft on static, or at least a crew to talk to (the USN crew last time were very limited in what they could discuss). 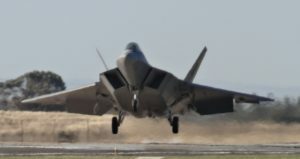 There’ll also be a couple of F-22As which are always spectacular to watch (and hear), some conference events I’m interested in attending, the warbird tarmac, a number of GA aircraft to check out and much more. I much prefer attending Avalon events on the trade days as the feel is quite different to public days. There are no barriers on the trade stands in the exhibit halls and the aircraft aren’t as heavily barricaded while the company & military representatives are more willing to discuss detailed technical aspects of their products. Of course, it’s also a whole lot less crowded! By Friday morning the barriers are up in the exhibit hall to stop people just wandering onto the stand and trying to take anything not bolted down (this has actually happened in the past), some of the aircraft are leaving and the barricades around static displays get expanded. Given this, I’m planning to attend Tuesday to Friday for business and only attend on Saturday if I need an extra day to complete my content gathering for PCDU. Despite everything, I do enjoy being at Avalon and have since I started working tarmac way back in 2001. 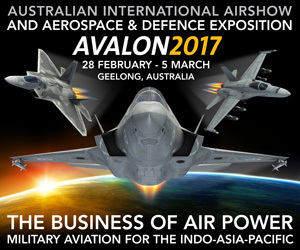 Between the new platforms, the client work and catching up with friends, I’m actually looking forward to Avalon 2017 more than I have the previous two events. Watch this space! The contents of this blog are licensed under a Creative Commons Attribution-Noncommercial-Share Alike 2.5 Australia License.